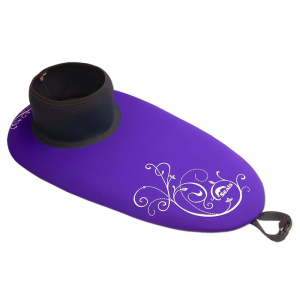 Seals Women's Calypso Kayak Spray Skirt - The Seals Calypso is a one-of-a-kind, specially made hybrid spray skirt for women with a neoprene deck and nylon tunnel. 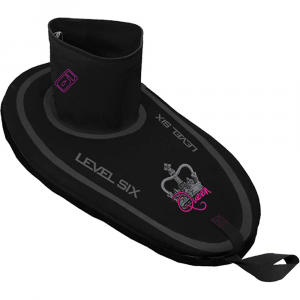 Great for paddling in moderate to extreme conditions, and made from high-performance 4mm neoprene with glued, stitched and sealed seams. EZ-stretch 3/8" stitched bungee attachment secures the skirt to the rim of the cockpit. Low-rise, 3-ply waterproof, breathable fabric tunnel features an adjustable neoprene waistband, 3 in. tall neoprene transition from the deck, and removable suspenders. Tribal style graphics on deck add a bit of flair, and all Seals spray skirts and accessories are cut and sewn in the USA. The Seals Women's Calypso Kayak Spray Skirt is ideal for most conditions and perfect for taking a little style with you into the water! 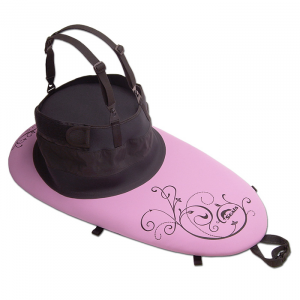 The Seals Calypso is a one-of-a-kind, specially made hybrid sprayskirt for women with a neoprene deck and nylon tunnel. 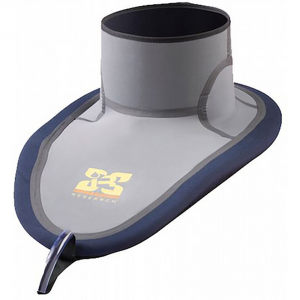 Great for paddling in moderate to extreme conditions (waves large enough to submerge your boat).This product will be shipped directly from Seals and will leave their warehouse in 7-10 business days. Eligible for UPS ground shipping only.Click here to find your Seals size. . Deck is made of high-performance 4 mm neoprene with glued, stitched, and sealed seams. EZ-stretch 3/8 in. stitched bungee attachment secures the skirt to the rim of the cockpit. Low-rise, 3-ply waterproof, breathable fabric tunnel features an adjustable neoprene waistband, 3 in. tall neoprene transition from the deck, and removable suspenders. Tribal style graphics on deck add a bit of flair. All Seals sprayskirts and accessories are cut and sewn in the USA. Custom sizes and colors may be available. Please call customer service at 1-888-463-6367 to learn more about a special order. Additional charges may apply..